It's great to be back in Palm Beach for a week with the family. Again, I'm trying to make the most of the weather and beautiful roads (okay, road). But this year, I've decided to forgo my usual rented racing bike and bring my Guerciotti from Boston. I used a borrowed flight case and, I must say, it worked pretty well. It was a bit of a chore to disassemble my bike (stem/bars out, pedals off, wheels off, skewers out, seat/post out) because I'd never done it before and some parts were pretty stubborn. But once it was done, it was done. JetBlue's policy is to charge $50 for a bike, but, remarkably, I wasn't charged at all - that could have been because my person didn't want to bother about it, but it was my only checked bag and I think it came in under the 50lb weight limit. The thing I was most worried about was actually pre- & post-flight, but the bag did fit perfectly fine into the back of our Subaru and into Papa's trunk on this end. Whew! I also discovered that I'd forgotten my old flea-bitten helmet, so I needed another. So I went to Relentless Bicycles in Lake Worth to and got a new Giro for $40... I also got a basic Cateye cyclometer (which I have yet to install, already more than half way through our holiday). The dude there is really friendly and we had a nice time chatting about this and that. I love bike people. Mostly. I've had a couple great rides so far down the island - one to Boca and back, another just to Delray. Nothing epic, but nice and quick and perfectly pleasant. I've been enjoying using Strava to track my rides - more basic than MapMyWhatevers, but also less battery-hungry. 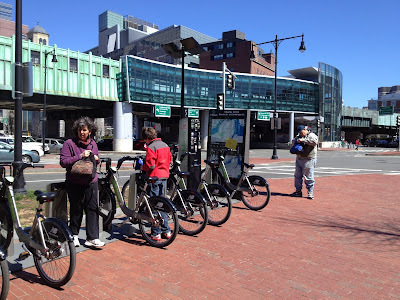 I finally got it together to commute into Boston on my bike once again, and I made it door-to-door in 40 minutes. According to Google, the fastest route on the T is 53 minutes - but I don't think I've managed it in less than an hour. I obeyed all the rules of the road as well. I took the most direct route, which worked out at about 8.5 miles, not bad. On the way home, I took a more circuitous route amounting to 10.6 mostly traffic-free miles, which took 54 minutes, including my long, steep slog back up the hill to my house. Not bad! Of course, I didn't see any clients today, so I didn't have to worry about changing - but if I can keep up this pace, I should have plenty of time for my ablutions on arrival from now on! So I didn't quite get my act together to bike all the way in today... But I did have a nice ride to Alewife and locked up there. With the advent of my new job (very exciting! ), I find myself heading into Boston with increasing frequency. Because I've been in a hurry and kitted out in relatively smart duds, I've been reluctant to bike all the way in - but that's due to change soon. It's chilly. Might rain. Must look spiffy. These are all the excuses I've heard from others for years and summarily poo-pooed. But they're pretty much what's been relegating me to the MBTA over the past couple weeks. As a result, my average time door-to-door has been close to 2hrs for a trip of only about 10 miles. Infrequent and unreliable bus connections is the biggest culprit, but I've also spent plenty of time waiting on Red Line platforms. What a waste of time! This will only get worse when they cut service this summer with a price rise to boot. So today, at least, I biked to Alewife and caught the T (after a 20 min wait). Definitely an improvement over having to rely on a bus. Tonight, I'm going to mount my trusty Ortlieb commuter bag and ride all the way in with a change of clothes tomorrow. It's a beautiful if chilly day in Boston. 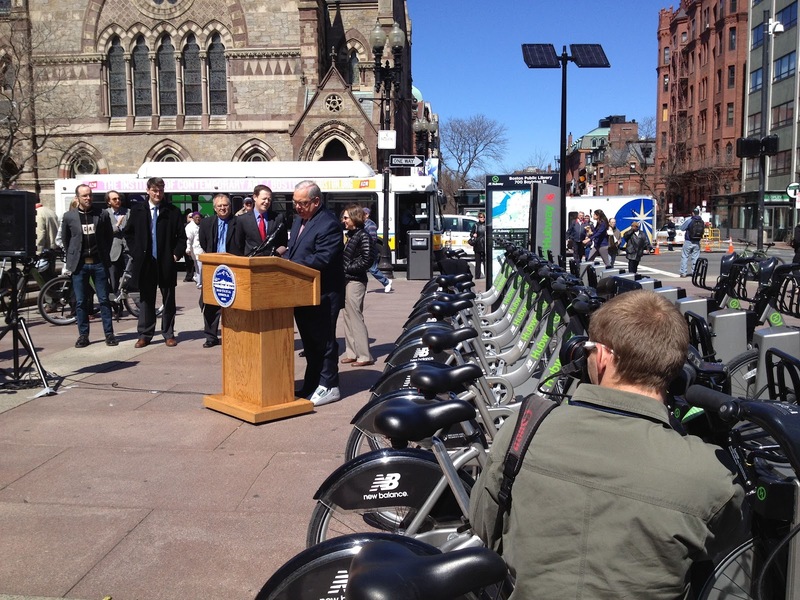 I've come into town for a meeting with my new client near Chinatown, and this morning, I got a message from Boston Bike Czar Nicole Friedman about the spring relaunch of the Hubway, Boston's own bikeshare program. I've been dubious of the program from the start... the climate, the limited number of bikes, and the great number of irresponsible students all seemed make it a non-starter in my book. But now I'm not so sure. I decided to get a bike at Park Street Station and ride it over to where Mayor Menino was speaking in Copley Square to see what's up. 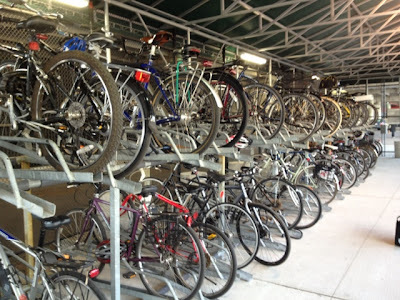 All I needed to take out a bike was my credit card, and I paid $5 for 24 hours of bikes. The machine spit out a secret code, which I then punched in to the first bike bay - and I was off! The bike felt great - it was heavy of course, but that was barely noticeable. Very solid and easy to ride with a nice upright posture. I rode through the Common and then walked across the Garden (trying to set a good example, you know), then down Newbury Street, and finally cut over to the Public Library, where the event was being held. The mayor did his thing, but I left in the middle and rode over to Charles MGH to hop back on the Red Line towards home. The last point gives me the most optimism about the program. If people like the system and the bikes stay in good shape, they'll always find a way from here to there. The biggest development should be when they expand across the river (come on, Cambridge!!!) - but in the meantime, I'm going to get my Hubway key!